If you've been thinking of picking up the Surface Dial, check out how you can program it to do your bidding! At least when it comes to music. So, I'm very impressed with the new Surface Dial. It's smaller than I was expecting but feels really nice to use. Plus it's easy to program! 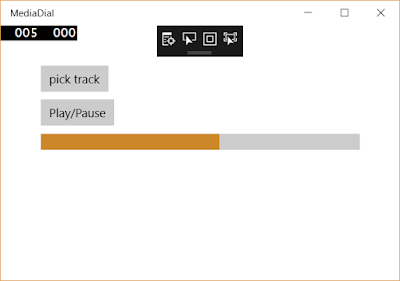 Yes, it's an ugly app but I wanted to see how easy it would be to use it to skip back and forwards through a playing track. I'll often be listening to podcasts and skip back a little bit to have something repeated. I thought this would be a suitable tool for such a task. Pick a track and it starts playing. 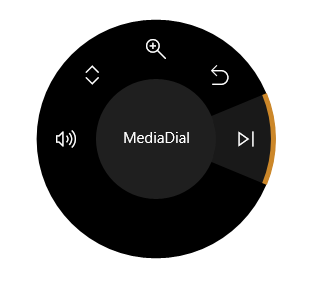 Tap the dial to toggle pause and playback. Scroll the dial to move forwards and backward through the track. There's also a button to toggle playback and a visualization of how far through the track it is. It's possible to automatically select the (radial) menu item but I couldn't get it to set in the page constructor, OnNavigatedTo event, or the Loaded event. Because it's tied to the window (so different apps can have different menu items selected) I can understand why it needs a window available but I would have thought this possible in the Loaded event. Instead, I set this when a track is picked in my code. Code embedded below and here. And if you're interested, here are some other SurfaceDial projects to check out.